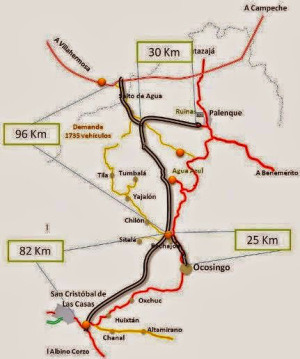 This shows the route of the super-highway from San Cristobal to Palenque. 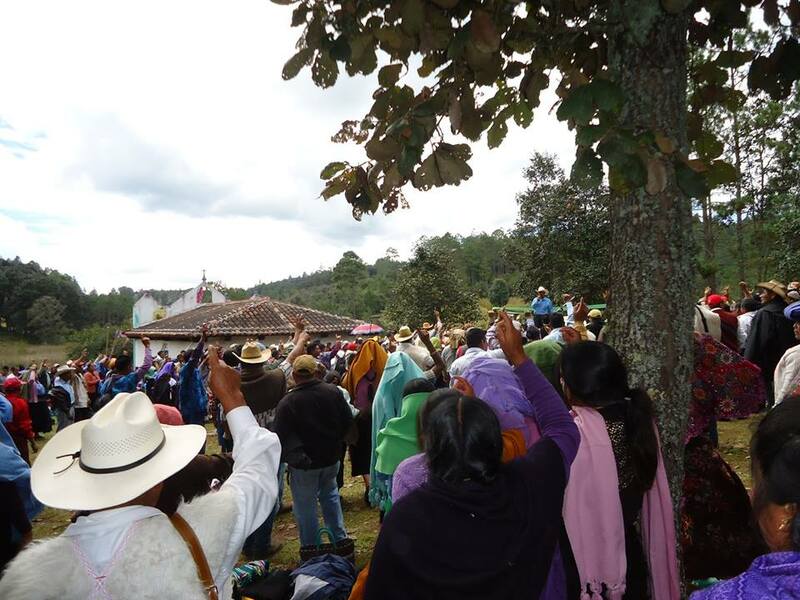 A little more than 2,000 people, between boys and girls, men, women and elderly people met in Laguna Suyul, convoked by the ejido members of La Candelaria. They were Tzotzils, Tzeltals, Chols and Tojolabals from the municipalities of San Cristóbal de Las Casas, Zinacantán, San Juan Chamula, Huixtán, San Pedro Chenalhó, San Pablo Chalchihuitán, San Juan Cancuc, Tenejapa, Amatenango, Chilón, Tila, Salto de Agua, Comitán and Las Margaritas. In this assembly of peoples they demonstrated their rejection of the San Cristóbal de Las Casas to Palenque super-highway project. The place is a hollow with an environment of pines and some milpas. A small hillock stands in the centre- an islet with trees and surrounded by waters from the place’s springs, the majority covered aquatic plants. At 10 o’clock in the morning, hundreds of people were waiting for the start of the assembly in that place. The assembly started with the speech of a representative of La Candelaria ejido: “This is a very important meeting for us. We are in a sacred place and the government’s project comes to destroy it. They want the super-highway to pass close to this lagoon, like 500 metres away and we are not going to permit it. We will not let the government crush us. We have to join our voices and think what we are going to do to stop the government’s plans. Two speeches followed him with information about the big neoliberal projects in Mexico, Central America, Chiapas, and in indigenous territories. 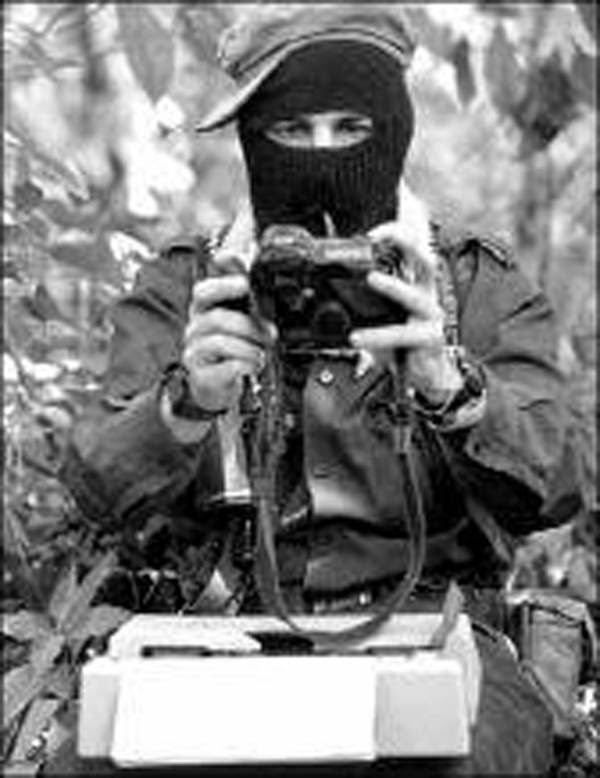 Several of them are underway: mines, dams, ecotourist centres, exploitation of oil fields, highways, ports, airports; planting of GMOs and biofuels and the containment and counterinsurgency programs that started in Chiapas in the 1970s. The work could not continue without holding community prayer. They planted a small cross, decorated with flowers. They planted a dozen candles and prepared the incense burner. They burned the candles and the burned incense perfumed the place; an offering to their God. There was the murmur of hundreds of people praying, of the petitions to their God, made from that space, from their sacred place… a place of communion. That moment full of symbolism gave way the concrete. The figure of the Ejido and its ejido authorities that were made invisible for decades by the indigenous and campesino social movements once again occupied the place that is due them in this conjuncture. It is the organization of the farmworkers with the legal standing to defend land and territory, just like the Communal Lands and Communal Land Commissions are. The representatives of the Salto de Agua ejidos gave their word this way: “I come representing the San Miguel ejido, a place with Chol Maya speakers. On June 1, 2014, gathered together in an ejido assembly, we agreed to reject the super-highway project.” The representative of the Francisco I. Madero ejido continued: “God has given the land to us. We are not birds that live in the air, nor fish that live in the water. We live on the land and we must and we are going to defend it.” The representatives of Adolfo Ruiz Cortines ejido, also from Salto de Agua, affirmed that last September 15, the 70 ejido members of that place agreed: “to defend the indigenous peoples’ lands” and called for “joining efforts,” and proposed the construction of “a front of struggle” and raised the demand for a “consultation with the peoples.” In their speeches they reported that they have updated their internal rules to better guaranty the interests of the ejido owners. The representatives of the San Jerónimo Bachajón ejido reported that in those hours, hundreds of their compañeros carried out a mobilization in Temó and that by agreement of their assemblies they reject the super-highway project. They added that they have named a commission to take the documentation and agreements from their assemblies to the Chiapas government and that “if they are not taken into account they will carry out new protest actions.” He called for unity and “to not let the big corporations conquer us.” They also reported that the ejido owners of San Martín Cruz have wanted to humiliate them for not signing the agreement for the super-highway and that in response the ejido owners took two municipal patrol cars that guard their community. He denounced that they are watched, persecuted and threatened for not accepting the super-highway project. In his talk the representative of La Candelaria ejido said: “We are seeing communities and ejidos that are willing to defend our life and our Mother Earth. It’s about defending it for our children. We invite the Bishop (Felipe Arizmendi) to place himself at the side of the poor; that he may defend the men and women that are in this union. We also call on all the pastors of the other churches to not abandon their faithful. May the pastors care for their sheep! May we not be divided by parties or religions! The government’s project affects all of us, without distinguishing. We are gathered together here to begin walking although threats exist. They are not going to kill this movement. They cannot kill our spirit. We see that we can do it with the unity of the communities. 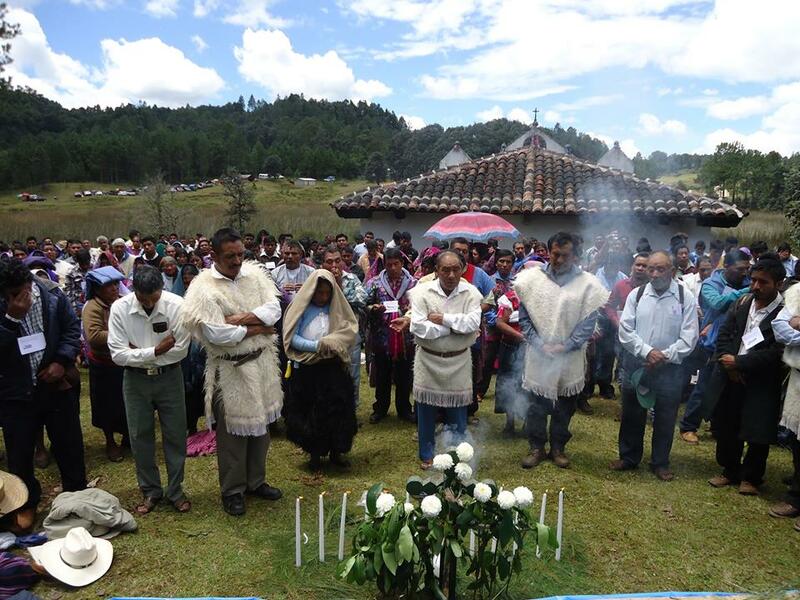 The assembly agreed to report: “the true word of the original peoples of Los Altos of Chiapas. From the heart of the peoples we make known the true word of boys, girls, youth, the elderly, men and women in defence of life. Mother Earth is the millennial gift that our grandparents have cared for and defended for generations. They cared for it and now it’s our turn to take care of it and defend it, if necessary with our own life. We will defend the environment, the fabric and veins of Mother Earth, rivers, lakes, water holes, mountains, trees, caves, hills, the life of the animals, the sacred places, the ecosystem of mother nature and the life of human beings. 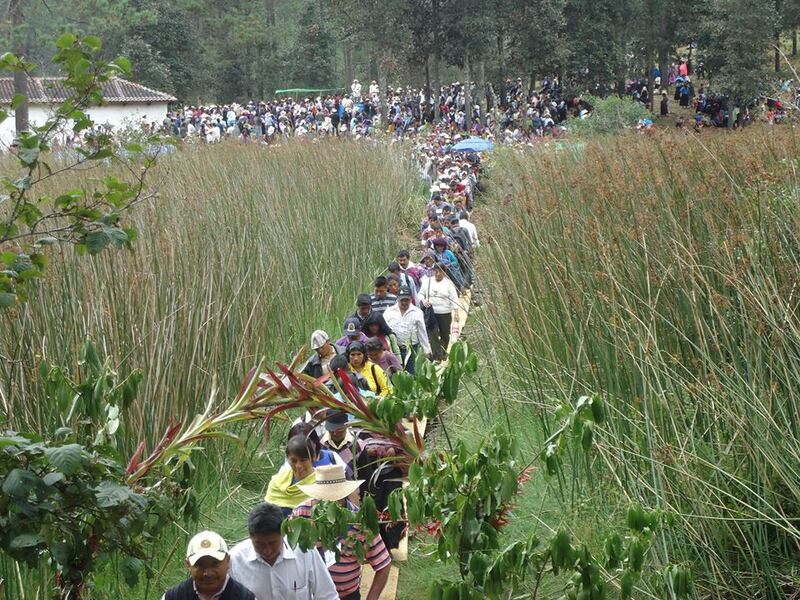 The Tzotzils, Tzeltals, Chols and Tojolabals concluded their communion planting 260 trees on the outskirts of the small slope. The Zinacantecos’ outfits, and those of the Chamulans and the Tenejapans were confused there with the clothing of non-Indians. They left the place in a long line crossing the lagoon over a small wooden bridge and misty waters of Suyul.